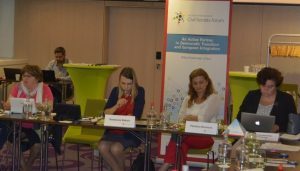 The EaP CSF Working Group 3 “Environment, climate change and energy security” held its Annual Meeting on 13-15 September in Brussels. The event covered topics related to waste management, sustainable development and renewable energy. Before the work of the Annual Meeting began, WG3 members participated in a joint training with WG2 members. The training was conducted by the representatives from the European Commission (DG NEAR and DG ENVI), UNIDO (UN Industrial Development Organization) and CEE Bankwatch and involved capacity building on green economy policies and monitoring of development funding. During the meeting members of the Working Group 3 presented EaP CSF 2016 re-granting projects, discussed further development of the WG3, the outcome of the , as well as possible contributions of the Working Group 3 to the EaP CSF Annual Assembly in November. The event was also an opportunity for Working Group 3 members to meet with EU stakeholders from DG NEAR (Neighbourhood and Enlargement Negotiations), DG CLIMA (Climate Action) and DG ENER (Energy), during which they discussed funding opportunities for CSOs, the effects of the Paris Climate Agreement on the Eastern Partnership framework and the EU’s energy strategies towards the region.